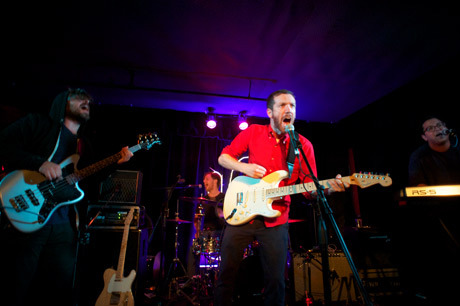 After gaining traction for their three LPs and infectious brand of danceable pop-rock, the Lovely Feathers petered out of the public eye in 2010; aside from one mysterious NXNE performance under a new name, the band pretty much disappeared. But, as silently and suddenly as they disappeared, the Lovely Feathers are back. Pared down to a four-piece, the band picked up where they left off, playing tunes from their last two records (plus some new ones) as if they never disappeared. The band has undeniably grown older: it was noted that drummer Ted Suss no longer takes his shirt off to perform, and some of the riffs in earlier numbers squeaked with a missed note or two, but as the Divan Orange crowd got larger, the band got better as they fed off of the hungry spectators' energy. Once the band launched into the opening riffs of standout "Wrong Choice," the audience exploded, with many spectators singing every word. That moment marked a turning point of excellence from which the band never looked back. With David Buzaglo's hooky keyboard lines, Suss' solid drums, captivating interplay between duelling guitarists Mark Kupfert and Richard Yanofsky and Kupfert's jittery vocals, the now-quartet undoubtedly found their groove, churning out hit after hit to the old diehards singing every word at the foot of the stage (not to mention the new converts at the back). By the set's end, the audience was almost part of the band, as the band's tambourine was passed into and around the crowd. They also played two new numbers, both shifting, upbeat stompers that reminded fans of their earlier work: hooky, infectious and exuberant. Hopefully this means a new LP in the works; it won't be a moment too soon.